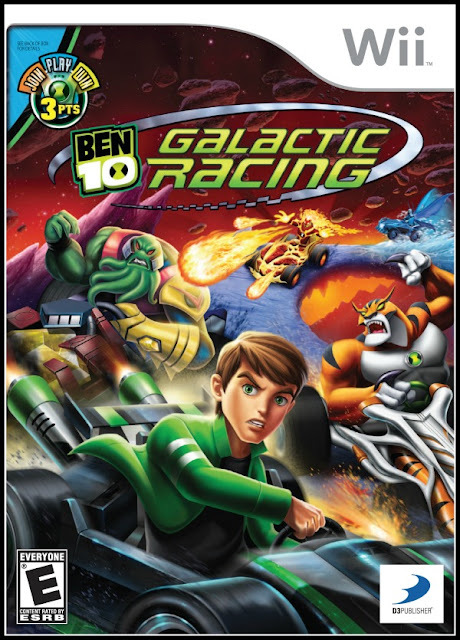 BEN 10 Galactic Racing lets players use offensive and defensive attacks themed to each character’s abilities as well as unique Omni-Node Pick-Ups, including a special Ultimate power that unleashes a super-charged, race-changing boost of speed, for those who fall too far behind. Players can race with or against friends in any of the various game modes where up to fourplayers can compete on the same screen at one time. These modes also allow players to win Galactic Grand Prix trophies from each of the circuits or race their favorite tracks in an attempt to set record-breaking times in Time Trials mode. BEN 10 Galactic Racing introduces the character Fasttrack, one of Ben’s new aliens making his video game debut on Xbox 360, the Wii™ system from Nintendo, PlayStation®3 computer entertainment system and the Nintendo 3DS™. Nintendo DS™ players can play as Diamondhead, another popular alien hero from the series, who uses one of his mighty fists to shoot shards to block other racers! This game caused a good amount of excitement when it arrived at our house. Our younger son, Owen, is a big Ben 10 fan. He was anxious to play the game. We were able to play a little together and I have played the game a little myself. It’s a fun game. If you’re familiar with the Ben 10 series there is many of the characters available to race with, with each you can choose one of two ‘cars’ to race with. So there’s lots of variety of racers, something my kids really enjoy, they love being able to make their onscreen racer look and feel different. The game is reminiscent of Nintendo’s MarioKart for Wii, but with a completely different look and feel, due to the Ben 10 theme. The controls are slightly different, which threw me for a bit. It does take a while to figure out what each of the power ups do, but that’s part of learning a new game. The game is not as easy as you might expect. So while we had a blast playing the multiplayer game, I had a more difficulty then I expected playing the first few tracks due to the fact that I kept losing. All in all, good game premise, decent graphics, and fun gameplay. I’d recommend this game if you have a big Ben 10 fan in the house or if you’d like a good multiplayer racer. However, if you have other kart style racing games and don’t want the Ben 10 theme, then you might have more thinking to do. This might make a great Christmas present for the Ben 10 fan in your house.